Mair Research has supplied a new finishing line for automotive tubes in Mexico. Mair Research has recently supplied an integrated finishing line for processing precision tubes for an important Mexican supplier of automotive tubing. In this project the tubes are 88.9mm diameter and 12m length. The line is placed at the direct exit of the new tube mill and designed to follow the maximum mill productivity ensuring continuous processing and collecting the finished tubes in strapped bundles ready for delivery to the end user. The layout has been custom designed together with the customer to optimize the available floospace. Since all operations are performed automatically, only two operators with supervisory tasks are sufficient to conduct the line. 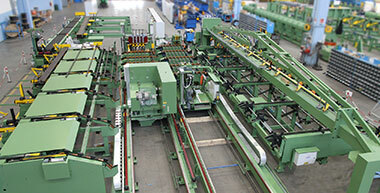 Driven rollway interfaced with the tube mill and equipped with cradle for the automatic collection of reject tubes. Tube sampling station. Tubes that require sample cut off are automatically extracted from the production flow and positioned to an upper cold saw for cutting of sample piece (generally max 300mm length). The remaining (nominal length) tube is automatically reinserted in the production flow. Chamfering machine. Both ends of round tubes are chamfered (facing, ID and OD bevel). The machine is equipped with a quick spindle replacement allowing to reduce the downtimes upon size changeover. Upon changing tube length the mobile part of the equipment (conveyors and mobile head) will relocate automatically to the new position. Swarf Removal Station. Suitable to flushout the loose inner bead of two tubes at a time in two stages. Pressurised emulsion jets act in the first stage and compressed air in the second stage. The bead is ejected to a swarf chopper which, by rotating knives, will chop the long swarf into short pieces conveniently collected inside a bin. Packaging machine. The tubes are automatically packed into hexagonal or square / rectangular bundles and then strapped. The weighing station will tilt the bundles to remove any residual emulsion and weigh the bundles which will be ready on the storage chains to be picked up by an overhead crane. A printer produces a customized anti-tear label including the company logo, bar code, weight and other data as required. The line is high-productive and designed to cope with the mill speed and may also handle square and rectangular tubes which will be sent directly to the Packaging Machine and packed into final products. Particular attention is given to tube handling as all parts that may come in contact with the tube are plastic coated in order to avoid denting and scratching. Mair Research is specialised in the design, manufacture and supply of finishing lines in general (automotive, OCTG, drawn, other) having delivered to very important world reference producers in the field of ERW and seamless tubes. All Mair Research equipment is fully designed, manufactured and assembled in our facilities in Italy. It undergoes strict preshipment tests usually conducted in the presence of the customer. Preshipment tests have proved to be beneficial allowing the equipment to be optimized in house thus reducing on site startup and commissioning works.